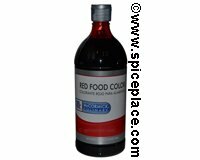 Use Red Food Color to tint desserts, candies, cakes, cookies and cake frostings. Add Red Food Color gradually and mix until the desired red color is obtained. Mix 1/2 tsp red food color, 1/2 cup confectioners sugar & 3 tsp milk to make a cranberry color glazed icing. For Easter egg dying, add 1 tsp vinegar and 1 tsp red food color to 1/2 cup boiling water. Dip hard cooked eggs for 5 minutes or longer.